The UNIQUE manufacturing (previously state-owned MAP: Manufacture d'Armes des Pyrenées, or Pyrenaic Mountains' Weapons Factory) makes the F-11 rifle for the french forces. It chambers and fires the .22-LR cartridge, feeding from a standard .223 magazine converted with a kit. I don't know if this rifle is semiauto-only or is capable of selective fire. 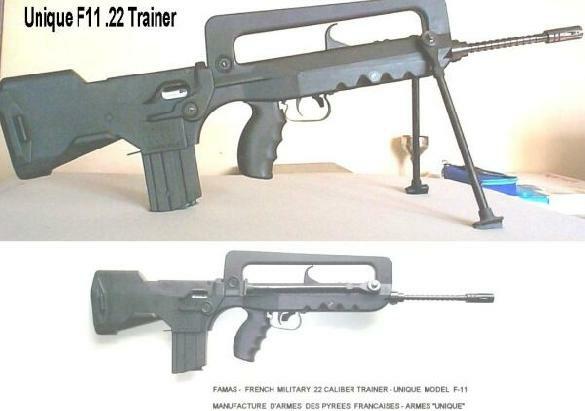 The MAP "UNIQUE" F-11 is the standard RECRUITS AND CADETS TRAINING RIFLE for the French Armed Forces.